Facebook Live and Twitter-owned Periscope are hot right now, there's no denying it. The two services allow anyone to live stream... anything, and they've been gaining in popularity recently. A lot. And now the elephant in the room decided to step forward and say a few words. We're talking about YouTube, of course. Google's property has done live streaming ever since 2011, "before it was cool" as it likes to point out. However, so far only big special events have received their own live streams on YouTube. Thankfully, that's set to change "soon". 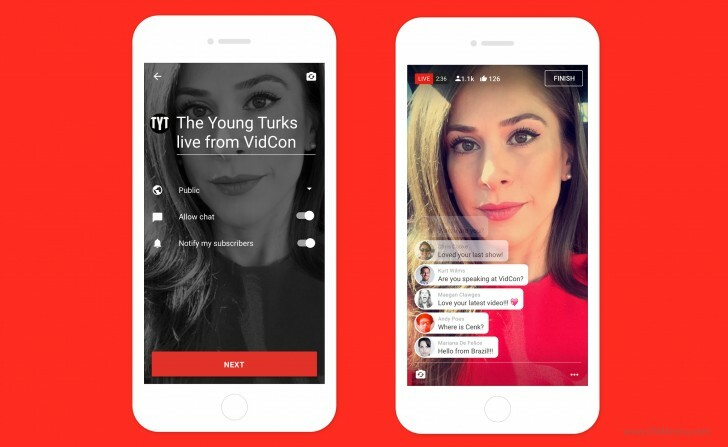 Yes, this means Google will finally make YouTube's mobile apps get the live streaming ability and thus be on par with Periscope and Facebook. It's puzzling why it took so long to happen, but it finally is. When this functionality reaches you, you'll notice because the red floating action button that's in the bottom right side of your YouTube mobile app will change to a Record function (currently it's used to upload already shot videos). When you see the new button, just tap it and you'll be live - well, right after you select a picture to use as a thumbnail. You can set who will see your broadcast, whether you allow chatting, and if you want to notify your subscribers that you're going live. While you are broadcasting live, comments will show up on top of your video feed, in a very similar way to what happens on Periscope. After you end a live session, it will still be available to people just like all of your pre-recorded videos are. Mobile live streaming videos will have all the features of the regular videos, so you'll be able to search for them, find them through recommendations and playlists, and protect them from unauthorized uses. Can't you already watch and record live videos on mobile like since..... Forever? How would I know I don't like it if I don't click it. I click to find if I like it, duhh. Its like YouTube's take of periscope. And if you don't like it...don't click. Simple.